Head Coach Keith Kresin, St. Johns High School - Keith Kresin graduated from Waconda East in 1983. His Coaching career began at Waconda in 1992 then on to Beloit St. John’s in 2003. Currently he is both junior high and high school football, girls basketball, which won the State in 1A DII this past spring and a track coach. Keith is in charge of the weight room at St. John's Catholic High School. His overall varsity football record is 99-53. Keith also farms. Keith has been married to his wife Sharon for 28 years and they have 3 grown children, Vincent 27, Vaughn 25, and Vanessa 22. Assistant Coach Jeff Hennick, Wallace County High School - Jeff Hennick graduated from Wallace County High School in Sharon Springs in 2008. He played football at Bethel College in Newton, Kansas in the fall of 2008 before transferring to Garden City Community College to play football in the fall of 2009. After earning his Associates degree there, he then moved on to earn his Bachelor Degree in Elementary Education at Kansas State University. He returned to Sharon Springs to coach under Kevin Ayers for 1 year where the Wildcats reached the State Finals and finished as Runner-Up. The next year he took over the program for Ayers and finished 11-1 in 2014, losing only to eventual State Champion, Victoria Knights. He teaches High School strength classes and elementary P.E. He also is an assistant coach for Junior High Basketball and High School Track. Assistant Coach Regio Hahn, Minneola High School - Reigo Hahn graduated from Oklahoma Christian university in Edmond Oklahoma in 1995. From 1993 to 2000 he coached at John Marshal High School in Oklahoma City In 2000 to 2003 he coached at Oklahoma Christian academy, then from 2004 to 2005 at Greensburg Ks. From 2012 to the present he has been the head football coach at Minneola High School. Reigo and wife Sherre have two children Brooklyn 15 and Colton 11. His keys to success are great kids, great administration, great community and great coaches. 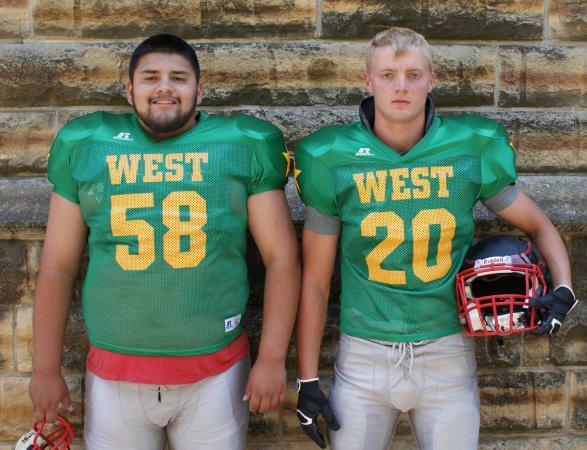 Connor Katt, Hoxie High School, Hoxie, has been selected to play on the West squad. He is a 2015 graduate of Hoxie High School. Football statistics and accomplishments include 2,500 career rushing yards. In 2013, 2014 Connor was selected All State Honorable Mention Running Back, All District 1st Team Running Back Linebacker, All League 1st Team Running Back, All Area 1st Team Running Back, All Area Super II Running Back; 2013, All Area Super II Runningback, All League 2nd Team Linebacker. Hoxie reached the State Playoffs in 2012, 2013 and 2014. They were District Champs, Regional Champs and Sub-State Runner-Up in 2014. In other Sports Connor qualified for State Track in 2013-placing 3rd in the 4x1, 2014-placing 4th in the 4x1 and 6th in the 200m. In basketball he was named Varsity Defensive Player of the Year in 2013 and 2014. Hoxie was NWK League Champs in 2014 and 2015 and Sub-State Champs in 2013 and 2014. Activities and honors outside school include CYO Prayer and Action, Hoxie FFA-help build school's new greenhouse after school and on weekends; Hoxie Rotary-student of the month. Connor enjoys hunting, fishing, trapping, golf, basketball and track. Activities and honors in school include Varsity Football, Basketball, Track and Field, 4 years; Class Officer 1 year, FFA 4 years, FFA Historian 1 year, FFA Vice President 1 year, FCCLA 3 years, Journalism 1 year, Yearbook Staff 1 year, Homecoming Royalty 2 years, Prom Server 1 year. Connor is the son of Allan and Sue Katt and his future plans are to attend North Central Kansas Technical College in Hays. 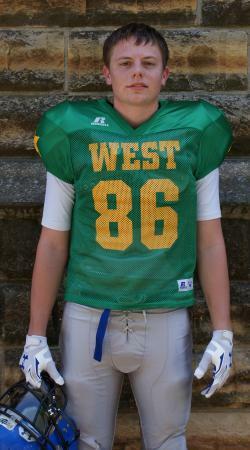 Grant Frasier, Weskan High School, Sharon Springs, has been selected to play on the West squad. He is a 2015 graduate of Weskan High School. Football statistics and accomplishments include lettering 3 years, named to the All League Team Honorable Mention 2013, First Team Defense 2013 and 2014, Second Team Offense 2014. Weskan was League Co-Champions in 2012, League Champions in 2013 and Bi-District Runner-Up in 2012-2013. Grant lettered in basketball 4 years and track 1 year. He is a member of youth group and enjoys hunting, spending time with friends and working outdoors. Honors and activities in school include National Honor Society, Choir Outstanding member. Grant is the son of Duane and Debbie Frasier and his future plans are to study agronomy and farm. 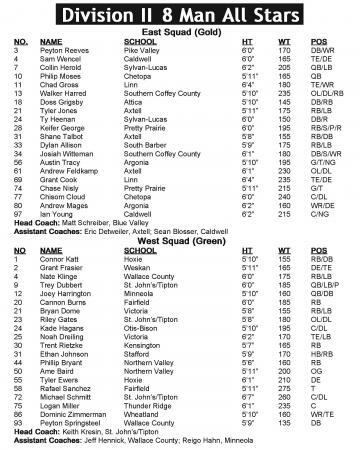 Nate Klinge, Wallace County High School, Sharon Springs, has been selected to play on the West squad. He is a 2015 graduate of Wallace County High School. Football statistics and accomplishments include 2012-All League 2nd Team Linebacker, 2013-All League 1st Team Running Back, 2nd Team Linebacker; 2014-All League 1st Team Running Back and 2nd Team Linebacker. Wallace County was State Runner Up, Sub-State Camps, Bi-District Champs, District Champs and League Champs in 2013; Sub-State Runner-Up, Bi-District Champs, District Champs and League Champs in 2014. Honors and accomplishments in other sports include: Freshman-Three-Sport Award; Sophomore-State Golf Qualifier, State Powerlifting Overall Champion 173 Pound Division, All League Basketball Honorable Mention, Three-Sport Award; Junior-Co-Captain for Boys Basketball Team, State Basketball All-Tournament Team, Basketball All League 2nd Team, League Basketball Tournament Most Inspirational Player, Topside Tip-Off All-Tournament Team, State Powerlifting, State Golf Qualifier, State Track Qualifier, Three-Sport Award; Senior-Co-Captain for Boys' Basketball Team, Topside Tip-Off All-Tournament Team. Activities and honors outside school include CYO, Big Brothers and Big Sisters. Nate enjoys spending time with family and friends, working on the farm, riding horses, roping, hunting, golfing and helping people. Activities and honors in school include National Honor Society and Student Council. Nate is the son of Derek and Marsha Klinge and his future plans are to attend college, majoring in farm and ranch management. 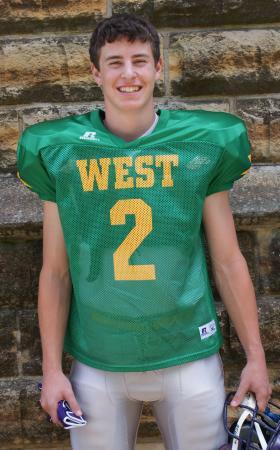 Trey Dubbert, St. John's Catholic High School, Beloit, has been selected to play on the West squad. He is a 2015 graduate of St. John's Catholic High School. Football statistics and accomplishments include 3904 yards passing, 64 touchdowns, 17 interceptions, average 95 yards per game, competed 276 of 512 passes for 54%. In 2014 Trey passed for 1590 yards, 28 TD's and 7 Int's and rushed for 389 yards on 127 carries scoring 11 touchdowns. Honors include: sophomore-Honorable Mention All District Quarterback and Safety; junior-1st Team All State Punter, District 1st Team Quarterback, Safety and Punter, Offensive Most Valuable Player; senior: 1st Team All State Linebacker and Honorable Mention Quarterback, District 1st Team Quarterback, Linebacker, Punter and Kicker; Defensive Most Valuable Player. St. John's was Bi-District Runner-Up with an 8-2 record in 2012; Sub-State Runner-Up with 11-1 record in 2013; and Bi-District Runner-Up with a 7-3 record in 2014. In other sports, Trey was a member of the basketball team that was the 2014 IA Div II State Champions with a 25-1 record and the 2013 team that was Sub State Runner-Up with a 19-4 record. He was selected State Tourney Most Valuable Player and 1st Team All State in 2014; 1st Team All Northern Plains League Top 5 in 2013 and 2014; member of the State Sand Golf 2nd Place Team in 2014, individual placings 7th in 2012, 10th in 2013, 10th in 2014. Activities and honors outside school include American Legion Baseball State Qualifier, Kids Lead, St. John's Cathollc Church Usher and Altar Boy, delivers Meals on Wheels. Trey enjoys spending time with family and friends, outdoor activities and water skiing. Activities and honors in school include Student Council President, Senior; Homecoming King, Senior; I Dare You Award, Junior; School Spirit Award, Junior; and High Honor Roll, 4 years. Trey is the son of David and Jeri Dubbert and his future plans are to attend Sterling College and play basketball. Joey Harrington, Minneola High School, Minneola, has been selected to play on the West squad. He is a 2015 graduate of MinneolaHigh School. Football statistics and accomplishments include 816 yards passing, 42 completions, 88 attempts, 9 touchdowns; 3,186 yards rushing, 483 carries, 6.6 yards per carry, 51 touchdowns; 138 receiving yards, 12 receptions, 11.5 yards per catch, 1 touchdown; 4,140 total yards, 61 total touchdowns, 123 tackles, 1 interception, 2 fumble recoveries, 2 forced fumbles, 1 blocked punt. He was selected All-State (all purpose), All District (quarterback, Offensive MVP), All League (quarterback). Minnneola was District Runner-Ups and Bi-District Runner-Ups in 2012; District and Bi-District Champions and Regional Runner-Ups in 2014. Joey was selected All-League in basketball, making the state playoffs. He was a member of the regional baseball runner up team and the 4x800 relay that qualified for the State Track Meet. Joey is a member of 4-H and FCA and enjoys hanging out with friends, and supporting other sports teams. Activities and honors in school include: Scholar's Bowl, band, vocal, Student Council President, NHS President, Class President, High Honors, Fort Hays State University Math Relays, President's Award for Educational Excellence, Citizenship Award. Joey is the son of Rusty and Stephanie Swonger and Chris and Amber Harrington and his future plans are undecided. 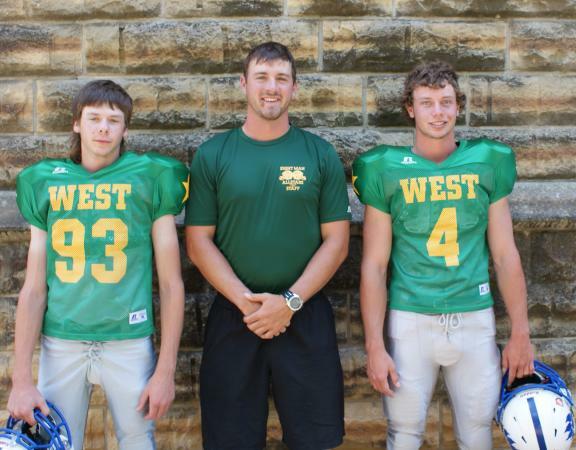 Cannon Burns, Fairfield High School, Plevna, has been selected to play on the West squad. He is a 2015 graduate of Fairfield High School. Football statistics and accomplishments include 4,496 yards rushing and 71 touchdowns. In 2014 he set the 8 man single season rushing record for 2,914 yards. He was seleted All State Co-Offensive Player of the Year, Hutchinson News All Area 8 Man Player of the year, All State 1st Team Running-back, All Sate Honorable Mention Linebacker, District 5 1st Team Running Back and Linebacker, HOPL 1st Team KB, LB. Fairfield had three consecutive winning seasons. Cannon was the 2014 KEMFA State Powerlifting Chamipon in the 165 lb class and was selected to the Burrton All Tournament team in basketball in 2015. He attends Grace Bible Church and enjoys hunting, farming and fishing. Honors and Activities in school include National Society member 2 years, Student Council member 4 years, FFA and FCA 4 years. Cannon is the son of Jerry and Becky Burns and his future plans are to become an electric linesman or play college football. 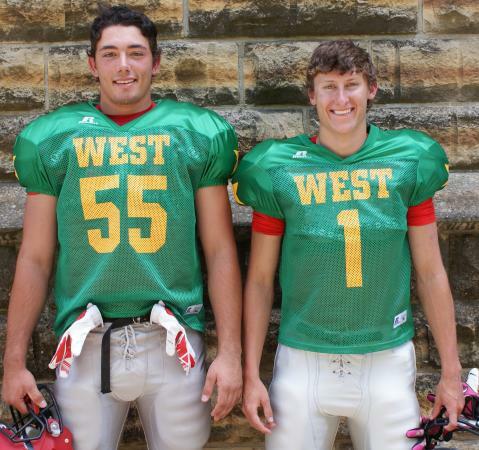 Bryan Dome, Victoria High School, Victoria, has been selected to play on the West squad. He is a 2015 graduate of Victoria High School. Football statistics and accomplishments include letter winner 3 years. He was named CPL Football All League Defensive 1st Team Defensive Back in 2012; All League Offensive First Team Running Back Unanimous Selection, All League Defensive First Team Defensive back in 2013; All League First Team Kick Return and First Team Running Back in 2014. Victoria was the State Champions in 2014. Honors and accomplishments in other sports include basketball letter winner 4 years, Basketball CPL All-League 3rd Team 2012-2013; All Tournament team member at the Hoisington basketball tournament 2 years; Central Prairie League All League Team Second Team, 1 year. Bryan enjoys hunting and fishing. Activities and honors in school include Class President (9), Vice President (10); V-Club member 4 years, FCCLA 4 years, FBLA 1 year, Skills USA 4 years, SADD 3 years, Student Council, 3rd Place Team Member at NCK Welding Invitational, 1st Place at Skills USA State Competition, Snowball Candidate and Homecoming Candidate. Bryan is the son of Stuart and Tammy Dome and his future plans are to North Central Technical College in Beloit, studying welding. 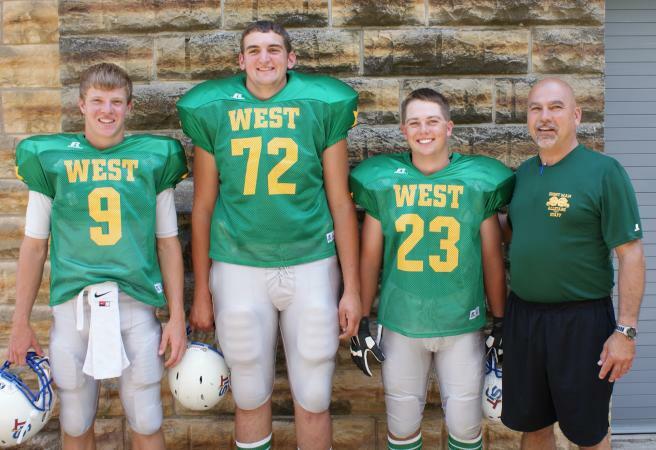 Riley Gates, St. John's Catholic High School, Beloit, has been selected to play on the West squad. He is a 2015 graduate of St. John's Catholic High School. Football statistics and accomplishments include: offense-1 reception for 19 yards and 1 touchdown, defense-24 solo tackles, 44 assisted tackles, 5 sacks for a total of 34 yards lost, 2 fumble recoveries-1 forced, 1 safety. He was a 3 year varsity starter. Riley was named 1st Team District Offensive Line in 2013 and 2014, Honorable Mention All State Offensive Line 2013 and 2014, Kansas Pre-game Spotlight Feature Player in 2014, 2013 Sports in Kansas All-Underclassman Team, 2014 Sports in Kansas Preseason Player to Watch, 2014 Sports in Kansas Top 100 Seniors in Kansas-Honorable Mention. In 2012 St. John's reached the football State Playoffs, was District Runner Up and Bi-District Runner Up; 2013-Northern Plains League Champions, District Champions, State Playoffs, Bi-District Champions, Regional Champions, Sub-State Runner-Up; 2014-District Runner-Up, State Playoffs, Bi-District Runner-Up. In Basketball St. John's was 2013 NPL Runner-Up, Sub-State Runner-Up, Osborne Preseason Tourney Champs; 2014-Lakeside Preseason Tourney Champs, NPL Champs, 2014 Sub-State Champs, 2014 State Champs. Golf in 2012 Riley placed 7th in the NPL Tournament, placed 3rd on the Regional Tournament Team, 5th on the State Sand Greens Team; 2013-NPL Tournament Team 3rd, Regional Tournament Ind. 10th, Regional Tournament Team, 3rd, State Sand Greens individual 9th, State Sand Greens Team 5th; 2014-NPL Tournament Team 1st, Regional Tournament Team 2nd, State Sand Greens Individual 10th, State Sand Greens Team 2nd. Activities and honors outside school include working at the Beloit Country Club, Prayer and Action Mission Trip, Muscular Dystrophy Camp Counselor, Usher, Server, Reader, and Choir at Mass. Riley enjoys golfing, attending K-State games, crossfit and weight lifting, hanging out with friends and watching sports. Activities and honors in school include StuCo Treasurer 2 years, SADD President 1 year, 1st Honor Roll all of high school, Scholar's Bowl, Speech & Drama, NPL Scholars Bowl Champions (2012, 2013 & 2014), State Scholars Bowl Champions (2014), Top 12 State Speech and Drama in Humorous Solo (2012), Top 12 State Speech and Drama in IDA (2013), Top 12 State Speech and Drama in Original Oration (2014), KVSV Student of the Week. Riley is the son of Brian and Julie Gates and his future plans are to attend Kansas State University, majoring in journalism and mass communications. Kade Hagans, Otis-Bison, LaCrosse, has been selected to play on the West squad. He is a 2015 graduate of Otis-Bison High School. Football statistics and accomplishments include 2013-All District Team, Central Plains League Honorable Mention Center; 2014-District Honorable Mention, Central Plains League Honorable Mention Center. In 2011-12 Otis-Bison was District Champs, Bi District Champs, Regional Champs and Sub-State Runner-Up; 2012-2013-District Champs, Bi-District Champs, Regional Champs. Kade helps promote sprint car races at the Rush County Fair and enjoys dirt track racing and hunting. He is a member of SADD, StuCo and KAYS at school. Kade is the son of Kirby and Kris Hagans and his future plans are undecided. Noah Drieling, Victoria High School, Pfeifer, has been selected to play on the West squad. He is a 2015 graduate of Victoria High School. Football statistics and accomplishments include selected Central Plains League Tight End and Linebacker. Victoria was the State Champions in football in 2014. Noah lettered in basketball 4 years and enjoys hunting and fishing. He is a member of the National Honor Society, V-Club, SADD and participated in Skills USA. Noah is the son of Jerry and Brenda Dreiling and his future plans are to attend North Central Kansas Technical College. 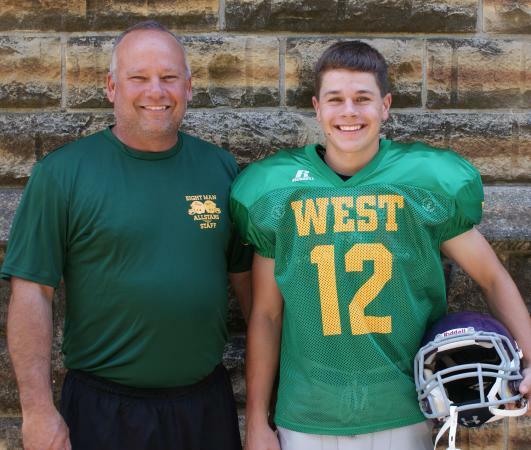 Trent Rietzke, Thunder Ridge High School, Kensington, has been selected to play on the West squad. He is a 2015 graduate of Thunder Ridge High School. Football statistics and accomplishments include 2012-2013: 133 carries for 925 yards & 18 touchdowns; 1st Team Special Teams Punt Returner, 2nd Team Running Back; 2013-2014: 158 carries for 1376 yards & 25 touchdowns, 1st Running Back, Punt Returner & Kick Return, Hays Daily News Super II Running Back, K-Preps All Sate Running Back, Team Captain; 2014-2015: 133 carries for 1394 yards & 29 touchdowns, 1st Team Running Back, K-Preps All State Running Back; Team Captain. In 2011-2012 Thunder Ridge had an undefeated season finishing as State Champions, District Champions and Regional Champions; 2012-2013 State Runner-Up, District Champions and Regional Champions. Trent was a State Track qualifier in 2014 in the triple jump and State Powerlifting Runner-Up in the 165 pound weight class - 815 pounds. Activities and honors outside school include 2014 Boys State Representative, KFC and TFC Youth Group, member of 1st St. John Lutheran Church, working for a farmer in the summer. Trent enjoys camping, wake-boarding and hunting. Activities and honors in school include lettering 4 years in football and 3 years in basketball and track. He is a member of the National Honor Society, Honor Roll all quarters of high school, Student Council Representative 4 years, Student Council President 2 years, KAY Board member 2 years and SITE C0uncil Class Representative 2 years. Trent is the son of Ryan and Tiffany Rietzke and his future plans are to attend Emporia State University and play football. 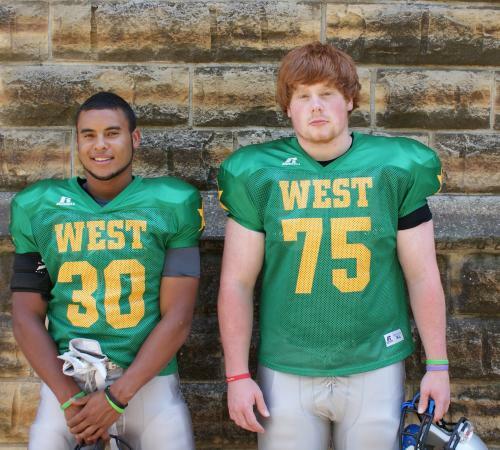 Ethan Johnson, Stafford High School, Stafford, has been selected to play on the West squad. He is a 2015 graduate of Stafford High School. Football statistics and accomplishments include 4,256 total rushing yards, 81 touchdowns, 312 tackles (135 solo). He was selected Heart of the Plains All-League First Team Running Back, 2nd Team Special Teams, Honorable Mention Defensive Back, Eight Man Division II All District 4 1st Team Running Back, 1st Team Defensive Back (2013), HOPL Honorable Mention Linebacker, All District 5 Running Back and Linebacker (2014), Kansas 8 Man All-Star Game Football Award 2015. In 2013 and 2014 Stafford was District Runner-Up with consecutive playoffs games. 2013 was the first playoff berth for Stafford in 23 years! Ethan lettered in football 4 years, basketball 4 years, track 2 years, regional qualifier in high jump freshman year, vocal 1 year, wrestling 1 year. He enjoys shooting, hunting, fishing, camping and hanging out with friends. Activities and Honors in school include FFA, Learning to Lead program, house construction STARS (after school program) greenhouse construction and community clean-up. Ethan is the son of Brad and Debbie Johnson and his future plans are to attend college and become an engineer. 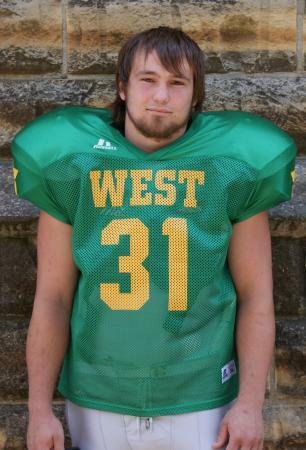 Phillip Bryant, Northern Valley High School, Almena, has been selected to play on the West squad. He is a 2015 graduate of Northern Valley High School. Football statistics and accomplishments include WKLL 1st Team Defensive Line sophomore year, All District 1st Team Offensive/Defensive Line; WKLL 1st Team Defensive Back junior year; All District 1st Team Offense/Defensive Line, junior year; WKLL 1st Team Running Back and Defensive Back; All District 1st Team Offensive and Defensive Back. Stats - Sophomore year: 138 carries, 811 yards; Junior year: 99 carries, 750 yards, 86 tackles; Senior year: 99 carries, 701 yards, 208 receiving yards, 14 catches, 142 tackles. Northern Valley was league champions in 2012 and 2014. Phillip participated in State Track and State Basketball. He is a member of Young Men's and CNA and enjoys football, track, FFA, CNA, Young Men's, hunting, fishing, camping and hanging out with friends. Phillip is the son of Charles Bryant and Melissa Adams and his future plans are to attend Dodge CIty Community College, play football, majoring in physical education and coaching. 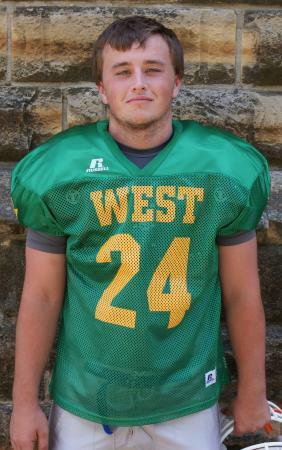 Tyler Ewers, Hoxie High School, Hoxie, has been selected to play on the West squad. He is a 2015 graduate of Hoxie High School. Football statistics and accomplishments include 2012-Honorable Mention Tight End, 2013-Honorable Mention Tight End and Defensive End, 2014-All League 1st Team Defensive End, All League 2nd Team Tight End, All District Defensive End, All State Defensive End. In 2013 Hoxie was District Champions, Regional Champions and Sub-State Runner-Up. Honors and accomplishments in other sports include basketball - 2012-1A-D1 Basketball 3rd Place, 2013-1A-D1 State Basketball appearance, 2014-1A-D1 State Basketball 2nd Place. Tyler enjoys dirt bike riding, hunting and fishing. He has been a member of FFA for 4 years and FCCLA for 1 year. Tyler is the son of Bruce and Shannon Ewers and his future plans are undecided. Rafael Sanchez, Fairfield High School, Langdon, has been selected to play on the West squad. He is a 2015 graduate of Fairfield High School. Football statistics and accomplishments include HOPL 1st Team Guard, District 5 1st Team Guard, District 6 2nd Team Guard, District 6 Honorable Mention Defensive Lineman, 8 Man Honorable Mention Guard, 8 Man All State Honorable Mention Offensive Line. Accomplishments in other sports include weightlifting 3rd Overall Heavyweight Class, Kansas 8 Man 5th Squat Heavyweight Class, 2nd Squat, 2nd Clean, 6th Bench Heavyweight Class. Rafael participates in forensics in school and enjoys cooking, fishing and calligraphy. Rafael is the son of Luis and Esmeralda Sanchez-Silva and his future plans are to attend Hutchinson Community College. 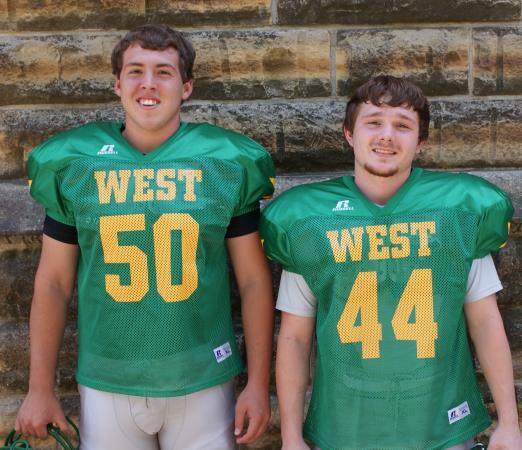 Michael Schmitt, Tipton Catholic High School, Tipton, has been selected to play on the West squad. He is a 2015 graduate of Tipton Catholic High School. Football statistics and accomplishments include All State Honorable Mention Offensive Line and All League First Team Defensive Line. in 2014 he had 25 solo tackles, 77 total tackles, 7.7 tackles per game, 3 sacks, 1 caused fumble. St. John's/Tipton reached the state playoffs in 2014, losing to Sharon Springs in bi-district. Michael was a member of the basketball team that was the Northern League Champion, Sub-State Champion and State Runner-Up. He was co-captain of the team. Activities and honors outside school include CYO President 1 year, 4-H President for 3 years and Vice President for 1 year. Michael enjoys hunting, fishing, and camping and family and friends. Activities and honors in school include Speech and Drama, Band, Choir, StuCo President 1 year. Michael is the son of Doug and Lori Schmitt and his future plans are to attend Hutchinson Community College, majoring in agronomy. Logan Miller, Thunder Ridge High School, Kensington, has been selected to play on the West squad. He is a 2015 graduate of Thunder Ridge High School. Football statistics and accomplishments include selection to the 2014 All-District Offensive Line. Thunder Ridge was undefeated in 2011and State Champions; 2012-reached the state playoffs, finishing as state runner-up; 2013-reached the state playoffs. Activities and honors outside school include Heartland Worship Center Youth Group member, Bible Quiz Team, Assembles of God Fine Arts State/National Competitor. Logan enjoys hunting, fishing and weightlifting. Activities and honors in school include KAY's, Student Council, FFA, Scholar's Bowl, School Play. Logan is the son of Tim and Denise Miller and his future plans are to attend Kansas State University, studying physical therapy. Dominic Zimmerman, Wheatland High School, Grainfield, has been selected to play on the West squad. He is a 2015 graduate of Wheatland High School. Football statistics and accomplishments include 2014: 42 receptions, 1027 yards, 24.5 yards per carry, 114.1 yards per game, 14 touchdowns, 690 kick return yards, 128 punt return yards, 1918 all purpose yards; Career: 70 receptions, 1400 yards, 20.0 yards per carry, 58.3 yards per game, 18 touchdowns, 995 kick return yards, 178 punt return yards, 2855 all purpose yards; 2014: 44 solo tackles, 38 assists, 88 total tackles, 122 total points, 19 total touchdowns; 18 punts, 545 yards, 30.3 average; Career: 133 solo tackles, 75 assists, 208 total tackles, 186 total points, 29 total touchdowns; 67 punts, 1765 yards, 26.3 average. Dominic was selected All League, All District, All State Wide Receiver; All League, All District Return Specialist and All District Defensive Back. He lettered in basketball 2 years and was captain/co-captain. Activities and honors outside school include Catholic Youth Organization, Legion baseball, Eagle Scout and Knights of Columbus. Dominic enjoys hanging out with friends and playing street basketball on 9 foot goals. Activities and honors in school include High Honor Roll, StuCo Vice President and Class of 2015 President. Dominic is the son of Rich and Deidre Zimmerman, and his future plans are to attend the University of Mary and play football. Peyton Springsteel, Wallace County High School, Sharon Springs, has been selected to play on the West squad. He is a 2015 graduate of Wallace County High School. Football statistics and accomplishments include 2nd Team All-League Defensive Back, 1st Team All-District Defensive Back, Honorable Mention All League Tight End. He had 76 tackles and 3 interceptions. Wallace County was the NWKL League Champions and Sub-State Runner-Up. Peyton participating in powerlifting. He was the 105 pound weight class runner-up, 123 pound weight class squat champion and 132 pound weight class squad runner-up. He also qualified for State Golf. He participated in football, golf and power lifting 4 years. Peyton is the son of Doug and Kari Springsteel, and his future plans are to attend Northwest Kansas Technical College. 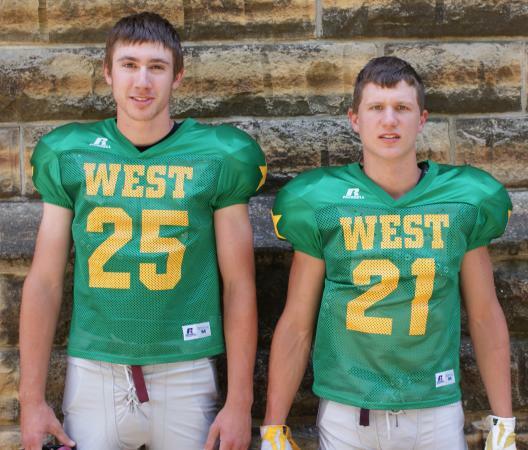 Ame Baird Northern, Valley High School, Almena, has been selected to play on the West squad. He is a 2015 graduate of Northern Valley High School. Football statistics and accomplishments 2013-WKLL All-League 2nd Team Defensive End, Honorable Mention Offensive Guard; 2014-WKLL All-League First Team Offensive Guard, Second Team Defensive End. He was a four year letterman on the Northern Valley varsity football team. Ame is a member of the National Honor Society and Teens for Christ youth group. He enjoys playing the guitar, playing all sports and hanging out with friends and family. Activities and honors in school include 4 years on the Honor Roll, Student of the Month, StuCo Vice President, Class President, Scholars Bowl, participating in football, basketball and track. Ame is the son of Doyle J. Baird and his future plans are to attend Northwestern College in Orange City, Iowa, play football and major in business finance.